I’m not much of a beach person. In theory, I love the concept—long days of laying in the sun, my hair naturally lightening, drinking cold beers alongside beautifully tanned, skinny friends—but unfortunately, I was not blessed with the gift of melanin. My Scottish/Irish/German/generalized cold, dark-dwelling ancestors didn’t anticipate a migration west, and therefore I am among the palest of folks living in the seaside state of California. This has been my cross to bear, and I’ve largely accepted it. One of the beautiful things about travel, however, is that you can reinvent yourself at will. So, I did just that upon arrival in the beach resort town of Nungwi, Zanzibar. I would be a carefree sun worshiper alongside the throngs of Italian tourists. Beer in hand, beautiful friend by my side, I finished my book (under a large umbrella), snorkeled off the coast of Mnemba Island (while wearing SPF 50. Ok fine, 75), and watched the sun set over the Indian Ocean from a traditional dhow boat (it was past “peak hours”). Little did all those bronze bodies know that I had fooled them all by playing along in their game, yet I had thwarted a sunburn. I may not have a beautiful tan to show for my time on the island, but I am more relaxed than I’ve been in quite some time and my future lack of deep wrinkle lines will certainly be worth the effort. 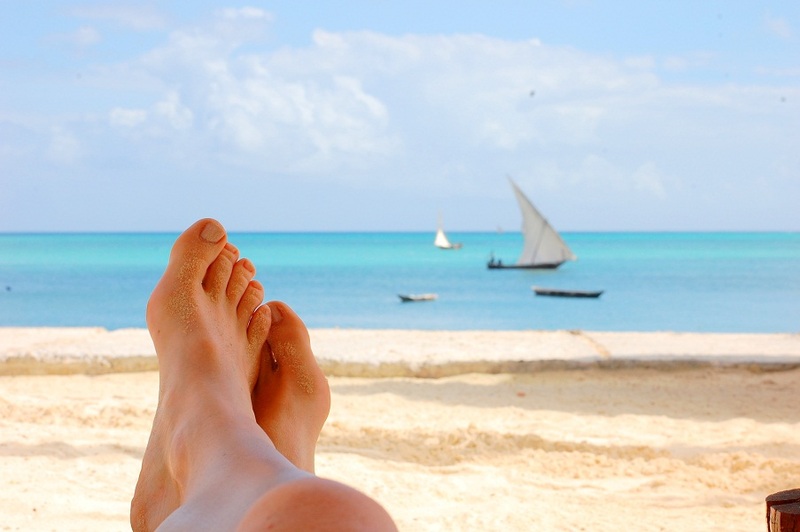 After five days of crystal-clear blue water and fresh seafood, we reluctantly left Nungwi and Zanzibar behind and headed to Johannesburg for our grand adventure in Kruger National Park. This time around I plan to pretend to be an expert big 5 animal tracker and hopefully receive a full-time job offer. It’s been nice knowing everyone in CA, but the lions are calling me once again. Please wish me luck.